A few days ago I wrote a post where I dealt with the mistakes my students made during their final exams. There were six common mistakes which I felt needed explanation and correction. In this post I will deal with six more common mistakes that my students make. Some of them are really elementary but some are more difficult. There is a mind map depicting the mistakes, their correction and an explanation. At the end of the post there are two games to practise the grammar you have learnt. 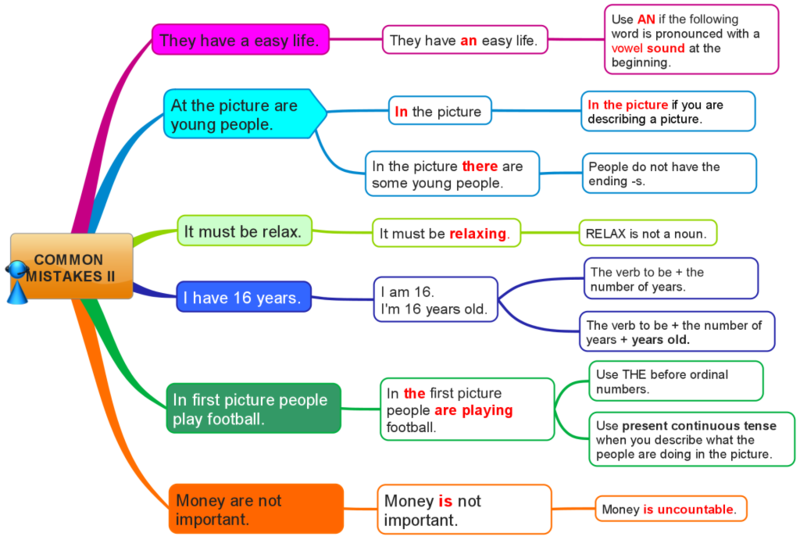 This mind map shows the common mistakes my students make. In the first column there are the mistakes, the second column contains the corrected version and in the third one you can find a short explanation. Learn from the mistakes others made. Once you feel confident that you know the correct grammar, it is time to practise the grammar in the following quizzes. In the first quiz there are several slides with different types of questions. Your task is to correct the mistakes and choose the correct options. If you answer more than 80% of the questions correctly you will get a chance to play the game Tower Defence. In this game you have to set your guards in such a way that they kill all the attackers before they get to your tower. I have passed 2 levels. Will you do better? Both the quiz and the game are in HTML5 so they should play on your mobile device. The second game is not in HTML5. It is in flash and it plays only on your desktop. You have to download the document and open it with Acrobat Reader. It is called Hoopshoot and your task is to choose the correct sentence and then score a basket. You can choose the difficulty of this game. Good luck. try to add visual sounds as well. Do not worry. You can try it again. By repeating you can learn a lot. What do you mean by visual sounds? Great material, really useful, just like others which you presented before. Thanks a lot. that,s very nice. We really benefit from this.